High quality lacquer container made of unbreakable and resistant plastic. For the best usage of 322 Eurofinish C Floor Duo and other lacquers with lacquer roller. Easy and safe handling thanks to mobile rollers. High quality grid made of unbreakable and resistant plastic Optimal for the usage of lacquer roller. Transparent, good sliding with bottom seam. 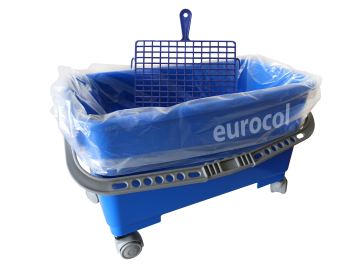 Ideal for filling and mixing 322 Eurofinish C Floor Duo and other two-component aqua lacquers.